Gluten-Free, Dairy-Free, White Sugar-Free recipes so you can indulge...Guilt-Free! Now you're speaking my love language. 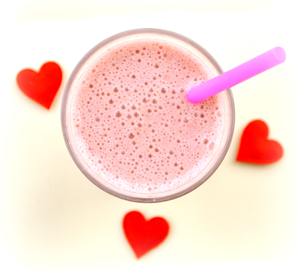 Get the recipe for pink "milk" and many more healthy Valentine's Day treats! Available on my post on HowDoesShe.com. In order to obtain true health benefits from chocolate, you will have to forego most pre-packaged chocolate found on store shelves. No worries! 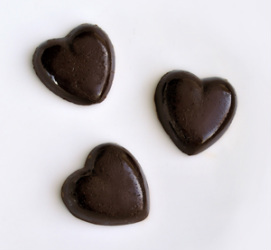 This super easy recipe will inspire the chocolatier in you. Show a little love to your heart with this twist on our most popular January recipe, full of heart healthy omega 3's & oats. Say good bye to mommy guilt!This protein packed health snack will leave you feeling like a super mom when your kids ask for more. Who knew dairy-free and gluten free tasted so heavenly? Single servings can be made utilizing a muffin tin and cupcake liners and are the perfect size for little ones. Chewy, delicious and natural!? Now why didn't I think of that! ?